For quite some time now Noah has been attached to this small plush Tigger that we bought in Disney World. Tigger would come with us randomly to Target, out to eat and always to my parents house daily. Noah would insist on Tigger sleeping with him nightly as well. Well lately Noah is obsessed with anything Toy Story. Thanks to Disney, it's everywhere! I guess I never noticed how much marketing is targeted at children. You can get a Buzz or Woody item in just about anything you desire. A kaleidoscope? Sure...what about a box of Rice Krispies? You got it, I swear they are on everything! We currently don't own the movies, he has only seen it when we watched it with Netflix. So, it doesn't help that Noah has no idea that commercials are just that a commercial and not the full length movie. If a commercial comes on with the characters he flips out and get so excited, but after that short clip he freaks out saying "More...MORE!" Like any good mother does, I fed into his obsession and purchased a Buzz doll at the Disney Store last weekend. I thought Buzz was enough and that we didn't indeed need all the characters. Noah begged to differ. We were that screaming duo in the store where every parent just thinks "Oh my child never acts like that". Noah started picking up random toys and just throwing them around the store. It was quite embarrassing. So what did I do? Oh, I tried to find the same sized Woody doll as well. Of course they didn't have it! All they had was the big Woody doll, and sorry Walt I wasn't paying for the big cowboy. So since we headed to check out with just Buzz and not his BFF Woody, Noah was hysterical. I stuck to my guns and left with just Buzz. I promised Noah that if Woody was at the Disney Store in Gulfport that I would buy it for him. At my outlet trip over the weekend I found Woody...the exact same size as Buzz. Perfect! I gave it to Noah and he was thrilled. 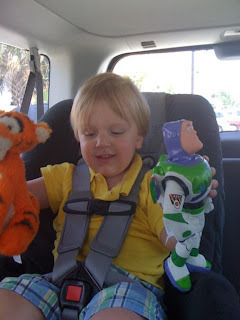 So now whenever we leave the house Tigger, Buzz and Woody all have to come. What an entourage we have!